So, did you stab Edward Cullen with a pencil or what? http://moniquelombardo.imgur.com/all/ CC supporting the read-write culture! Why has it taken this long for copyright laws to reach a happy medium? The audience consumer value has changed to that of a prosumer status calling for a change in copyright. In the eighteenth century, copyright laws were almost non-existent in the public domain before the introduction of content copyright of fourteen years after it was published. Then, copyright laws went on a rampage after Disney pledged for the copyright time to be extended. Society saw it change to 50 years, 70 and now ultimately 120 years for corporate authorship! Just insane to think that the brilliance encapsulated within the content produced under these laws can not be explored further and become something spectacular. This is just limiting the consumer–or now prosumers– creativity and freedom. When in fact the internet emulates a sort of false scarcity in the midst of its free flowing content ability. Over the last 10 years, a new balance has been created with the introduction of Creative Commons (cc). This new license allows artists, companies and creators to permit the use of their content to the audience and allow them to remix, remediate and recreate. Although, some rights are still reserved, it encourages this read-write culture. 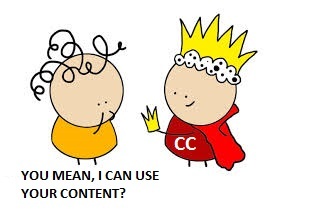 Now that we have received a sort of offering (as the meme suggests) from Creative Commons consumers are cherishing the new freedom that they have to explore areas past their previous confines. One step forward for consumers!